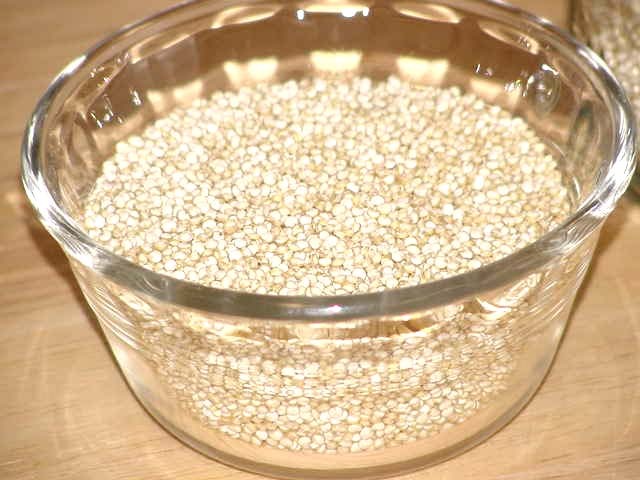 For years now I've been hearing about this quinoa, an ancient protein-rich seed that is actually related to spinach and swiss chard, rather than being a grain like most people (myself included until I just read about it on the world's healthiest foods website ) think. 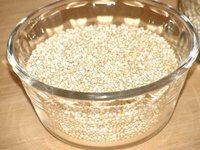 One of the things that makes quinoa stand out is that it is a complete protein, containing all nine essential amino acids, which makes it especially good for vegetarians. It is especially high in the amino acid lysine, which is necessary for tissue growth and repair. 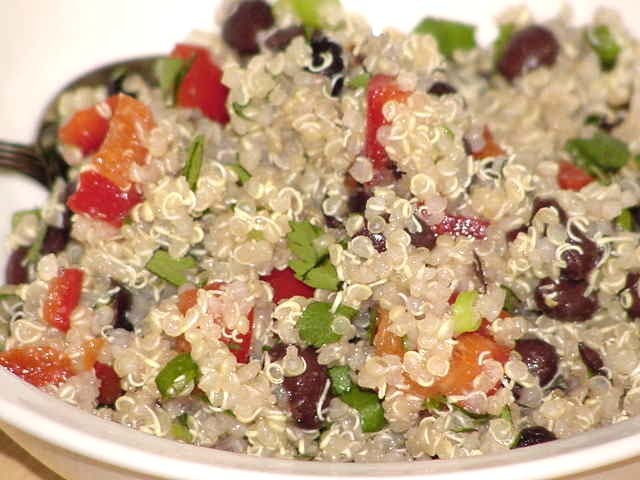 Quinoa is one of those things I've always meant to try but never got around to. Something about the description of what it is like held me back - it sounds like one of those things where the texture can make it really really good, or really really bad. But I'm serious about trying to eat healthier foods more of the time, so I picked up a box at the grocery store and decided to give it a try. I have several recipes that call for quinoa, so I'm not sure why I adapted a Southwestern Lentil and Couscous Salad to quinioa and black beans. If I had known it was a seed and not a grain, I don't think I would have used it in this recipe. The jury is out on this one. I know it's super good for me; I just don't know if I like it or not. It sure looks pretty, though, doesn't it? Have you got a sweet tooth? If so, I'd suggest cooking it plain and having it for breakfast as porridge with some dried fruit and maple syrup. It's got a lovely nutty flavour. I serve it often with fish, instead of rice. It would probably be really good with fish, Sheryl. Somehow I'm having trouble picturing it with sweet. I think it's because I haven't yet got a handle on it being a seed and not a grain. I think it was the cumin that made the salad taste off to me. I definitely plan to play with it some more. You can also buy flavored instant cereals. We have a Chai flavored one, but I don't like it because it has ginger in it - yeeecccchhhhh. What a cool website, Jen. That recipe looks really good. I printed it out and plan to try it.